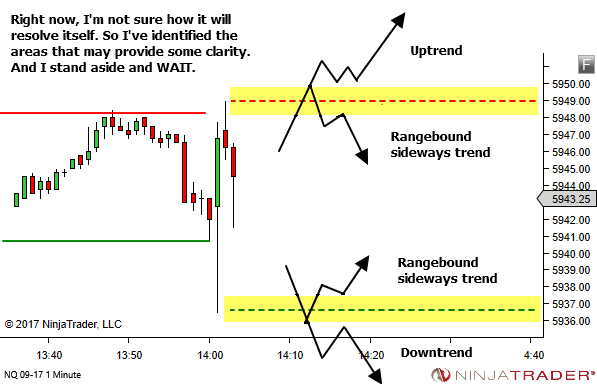 The YTC Price Action Trader provides clear definitions for a trend – uptrend, downtrend and sideways trend. 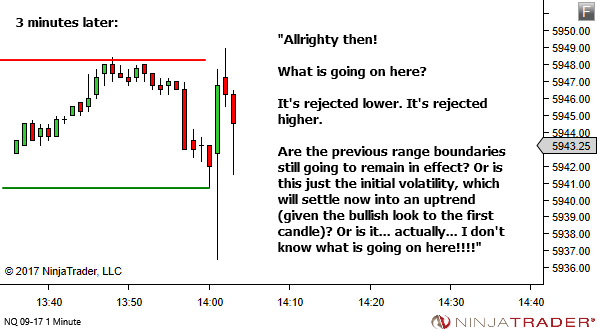 But despite this, there will be times where price action offers something that is not so easy to read. It would be great if the market was always smooth and easy to read. But it's not. WAIT until it is clear. 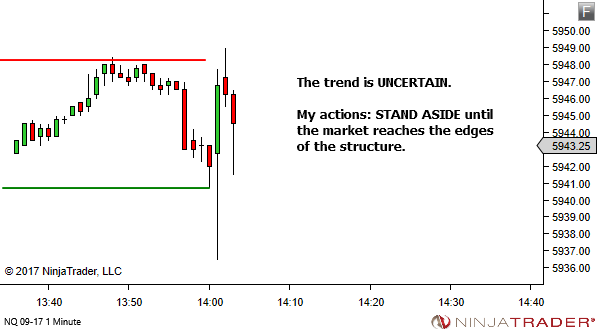 If you wish to make "Uncertain" an additional trend type for your trading, alongside up, down and sideways trends, then by all means do so. But either way, the plan is to wait until it is clear. STAND ASIDE completely. At least until price reaches the edges of the structure. What do I mean by "the edges of the structure"? It's the place where the market has potential to transition into something that is more readable. Something that does fit more nicely into the definitions of up, down or sideways trend. 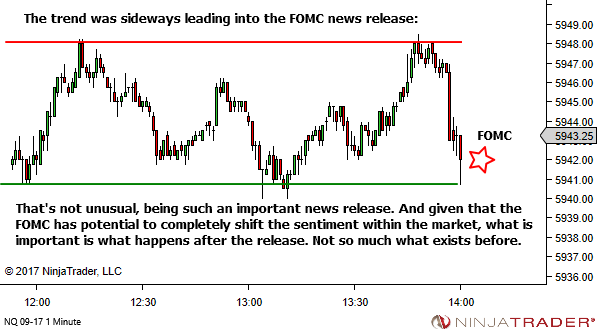 An important news release has the potential to completely shift the sentiment of the market. 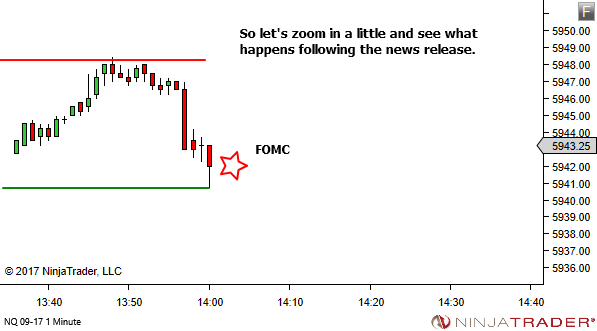 Sometimes the new trend structure is not completely clear, immediately following the news release. 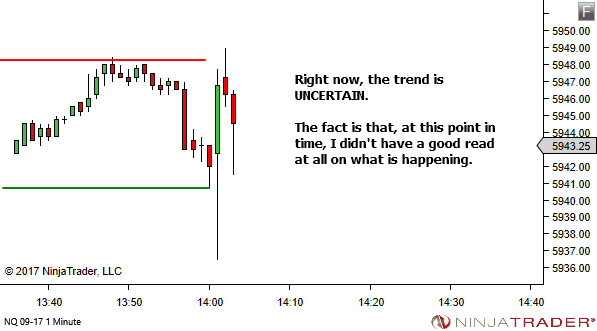 If the trend is uncertain, WAIT until it is clear. At least until price reaches the edges of the structure, where the trend will (hopefully) become more readable. The same applies at any other time, outside of news releases. If the market is choppy and you just don't have a good read, it's fine to declare it uncertain. Zoom out on the chart and identify the edges of the structure. Where are the upper and lower zones which might offer some clarity as to what is happening from then on. And stand aside until price reaches these zones. It's ok to not know. "Uncertain" can be a valid trend type. 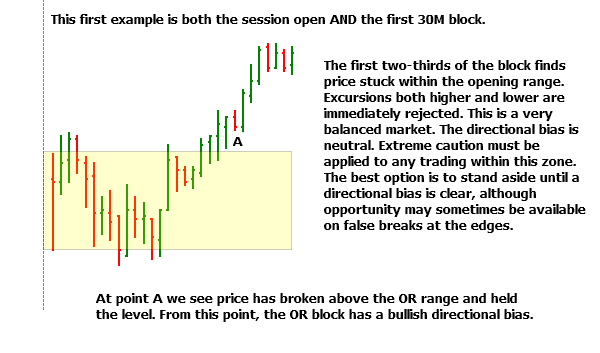 Almost all trading sessions will contain one to two price sequences which are absolutely the best. These can be the difference between an average session where you just grind out a small positive result and a great session where you hit it out of the ballpark. The price sequences which make your day. 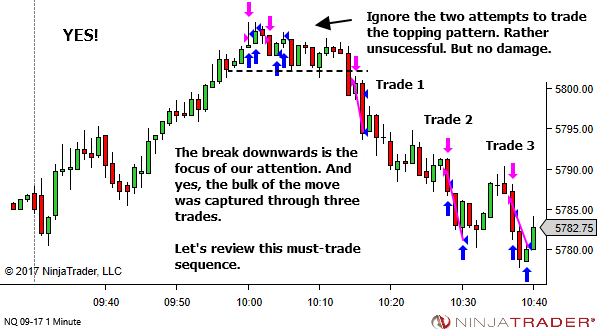 How you define a "must-trade" price sequence will vary from trader to trader. But for most of us they will be the largest and most directional price swings, with smooth price flow at a nice pace. Everything just right! There can be value in reviewing these post-session. Which were the Must-Trade Price Sequences? If so, how well did I perform? How did I recognise the opportunity? How could I have done better? If not, was it reasonable to expect that I should have caught them? Why did I fail to capture them? How could I have done better? 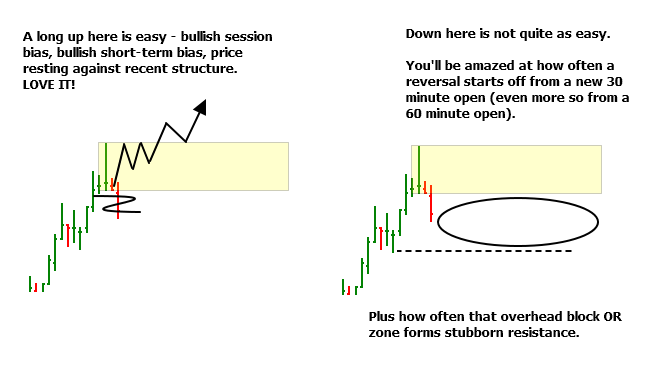 I've long been a fan of Opening Range (OR) theory and the way that it allows us to quickly and easily identify a "bigger picture" session bias. 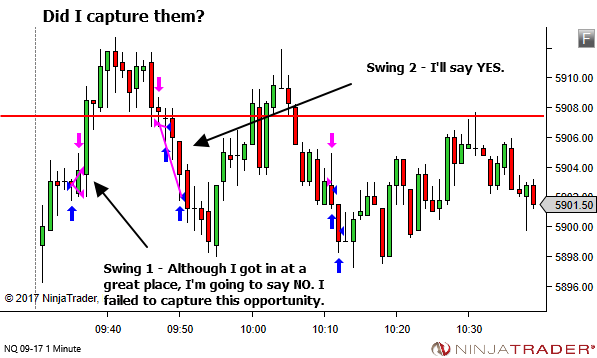 So last week we played around with that concept and explored it's application in new areas of the chart. 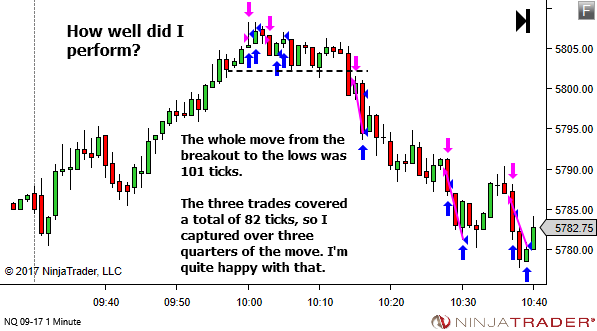 We took the concept of OR theory and applied it not just to the opening bar of the session, but to multiple bars throughout the session as well. 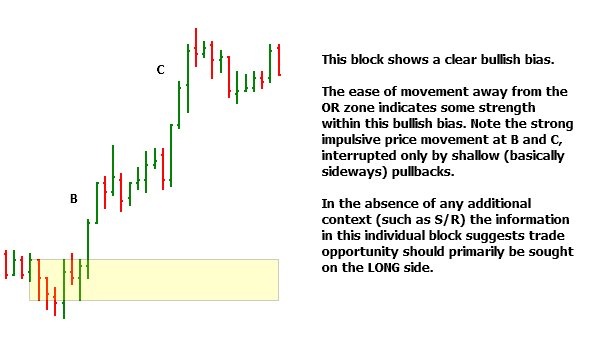 In my own trading, using the 1-minute Trading Timeframe, I apply this to the opening candle for every 30 minute block of data. This allows me to not only have the "bigger picture" session-wide bias, but to also get a feel for the bias on a shorter timescale as well. 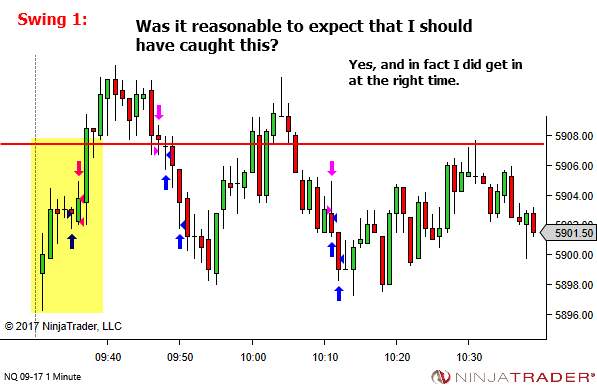 Think of it as being like multiple-timeframe analysis. The standard OR provides a bigger picture session-wide bias. 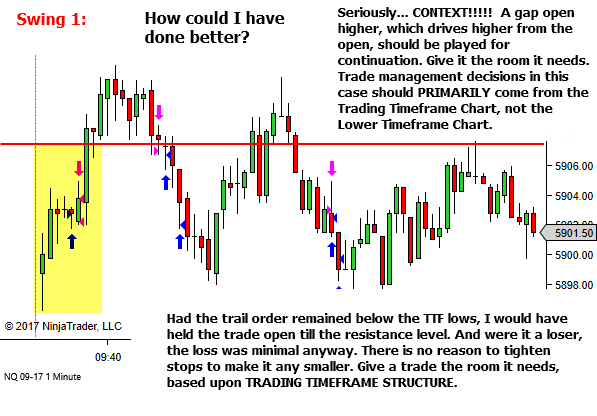 The 30 minute OR’s provide a picture of the shorter-term bias “inside” that bigger picture bias. A sense for the short-term directional bias. Price movement above the OR is bullish. Price movement below the OR is bearish. And price movement stuck at the OR is neutral. 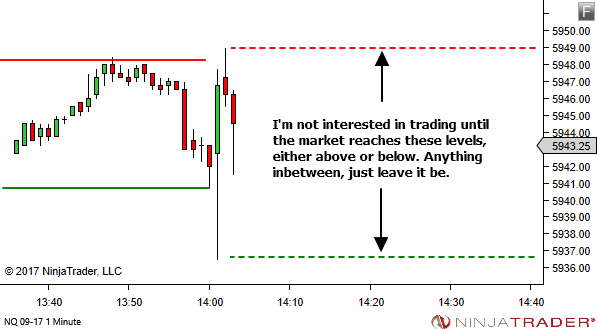 A feel for the underlying strength or weakness within this directional bias. Fast-flowing price movement with little overlap shows a strong supply/demand imbalance. 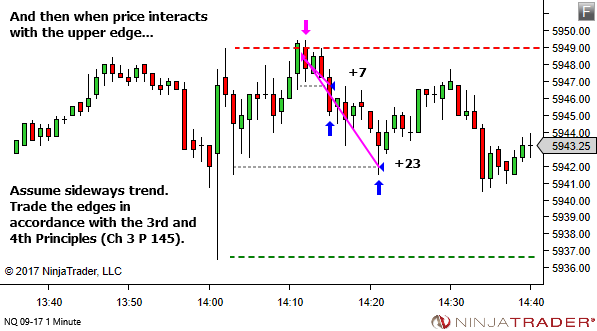 Whereas overlapping, choppy action suggests a much more balanced market. The real strength of this method though, is not in analysis of an individual 30M OR block. Rather it comes through assessing the information from the current OR block within the context of either the overall session bias or the preceding couple of OR blocks. 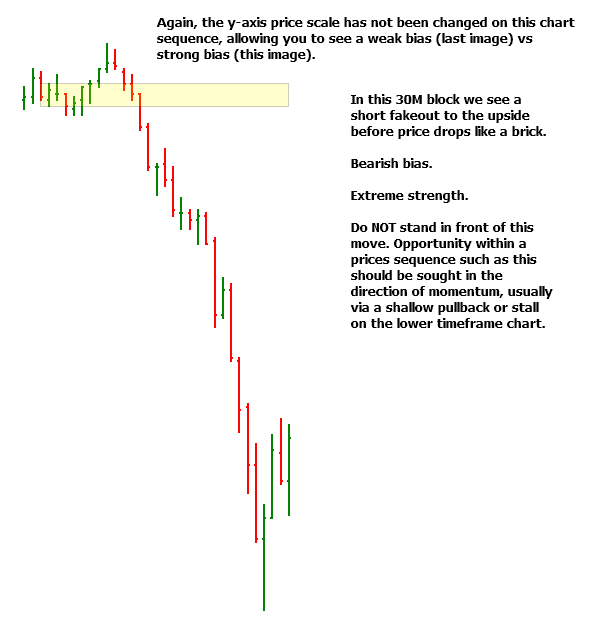 If you like this, I highly encourage you to play around with the charts and see what other information you can gather, in relating one single OR block to those preceding it. This is not my primary tool for conducting analysis. I assess short-term bias through six "rules of thumb" which allow me to project the current trend forward in time, identifying the highest probability path for the next couple of price swings. I share this method in my eBook series (Chapter 3). 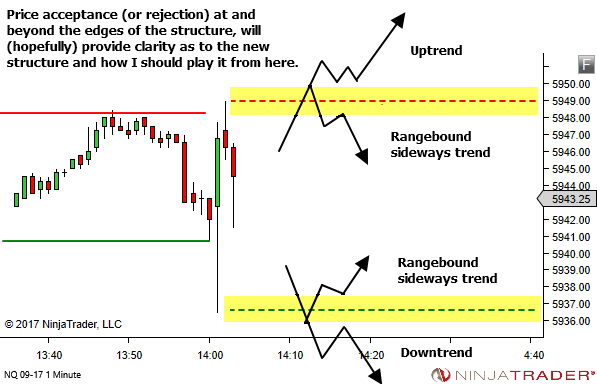 The same applies for the method I use to assess strength and weakness within the trend. Also Chapter 3. Short-term OR Theory is something that has crept into my analysis process over time, which acts to nicely complement the existing methods. Sometimes it acts simply to confirm my other analysis. And other times it provides a slightly different perspective. Either way, I find it adds value. If this idea appeals to you, try it alongside your current methods of analysis and see if you find the same benefits. I highly recommend spending some time every now and then just playing with your charts. Or see if you can apply old ideas in new ways. Just occasionally, you may find something useful. Today I'd like to share a simple tool that I've been using for the last few years, alongside my existing approach to assessing short-term market bias and the strength or weakness within the price action. IMPORTANT NOTE: This is not my primary tool for conducting analysis. 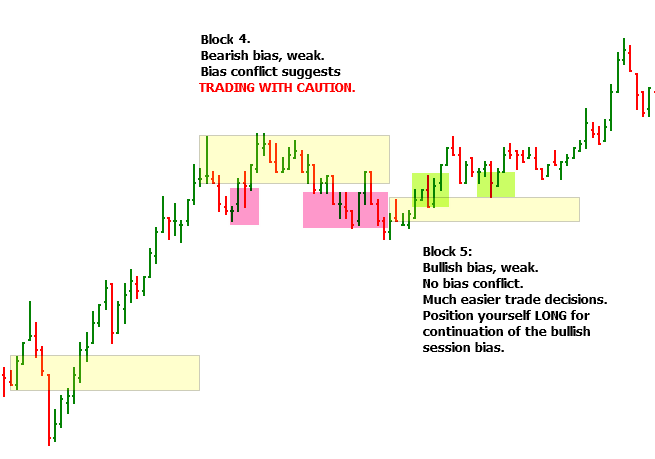 I assess short-term bias through six "rules of thumb" which allow me to project the current trend forward in time, identifying the highest probability path for the next couple of price swings. I don't share this in the newsletter or blog (sorry!). If you're interested you'll need to see my ebook series (Chapter 3). 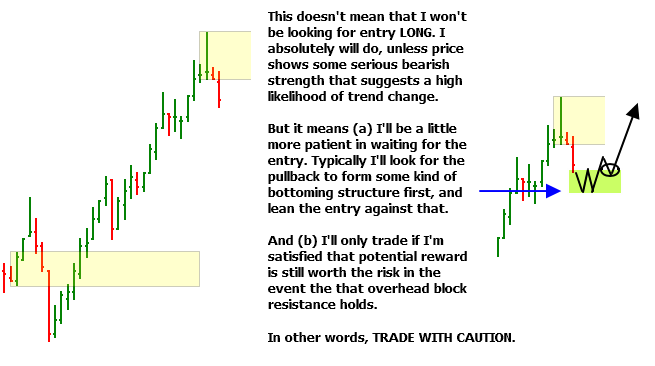 The same applies for the methods I use to assess strength and weakness within the trend. Also Chapter 3. What we discuss today is something that has crept into my analysis process over time, which acts to nicely complement the existing methods. Either way, it adds value. This discovery came about through "playing" with Opening Range theory and seeing where else it could be applied. 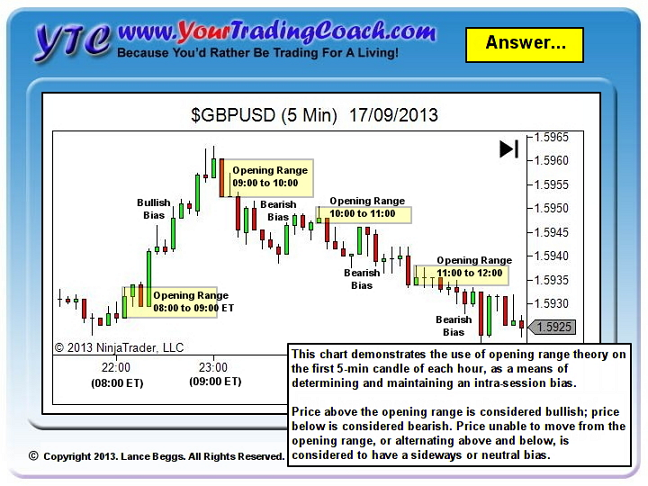 We've discussed the Opening Range previously in a few articles if you want some background reading – http://yourtradingcoach.com/tag/opening-range/. So now, let's apply this in a new way. I've never seen anyone else do this. I'm not sure why? I think it's an absolutely brilliant method of maintaining an intra-session bias. 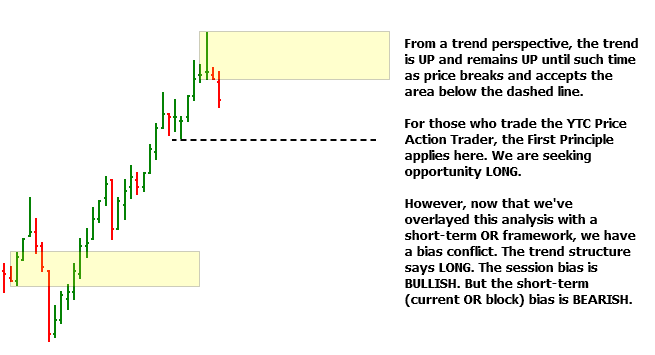 And it works just beautifully as an additional method to support other YTC Price Action Trader analysis. 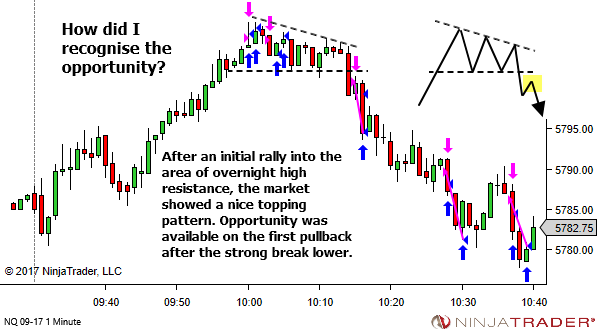 The hourly open is a significant occurrence, visible to traders on all timeframes from 1H down to 1M. 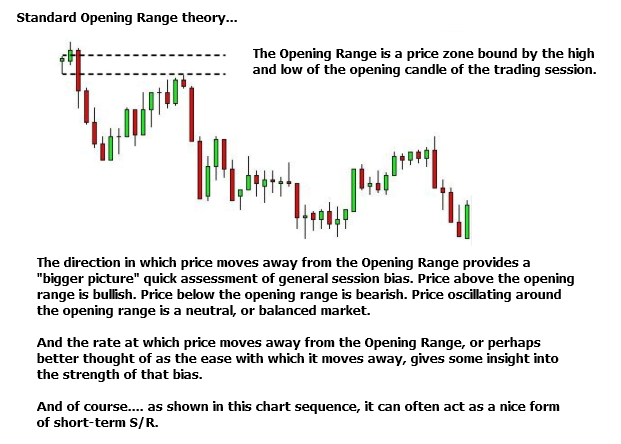 As such, opening range theory applied to the first Trading Timeframe candle at this point works well in giving a quick indication of current bias as either bullish, bearish or neutral. 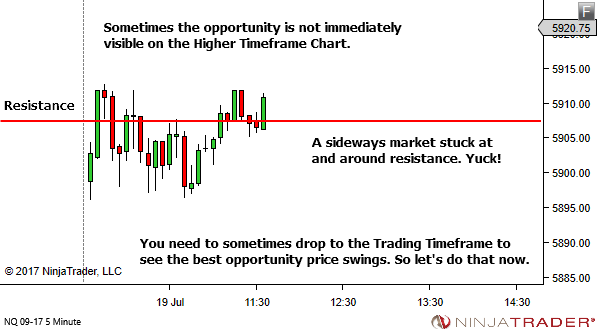 The same applies for 30 minute opens, if you prefer to look at this even more short-term. 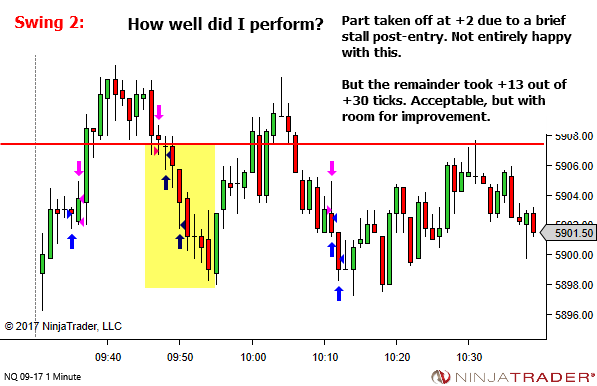 My preference has shifted to using the opening 1 minute candle, each 30 minutes. 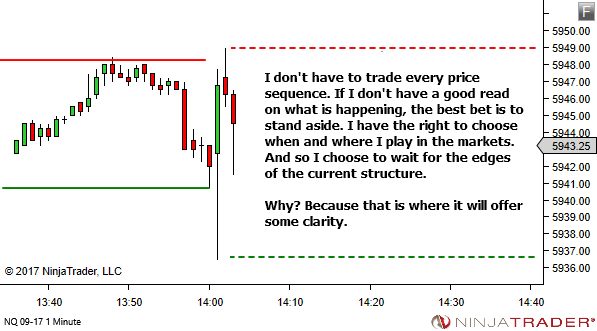 I find this works well for the 1 minute trading timeframe. 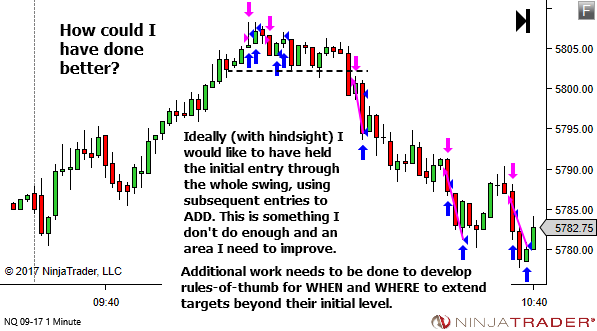 If your trading timeframe is higher then just increase the size of the segment as appropriate. 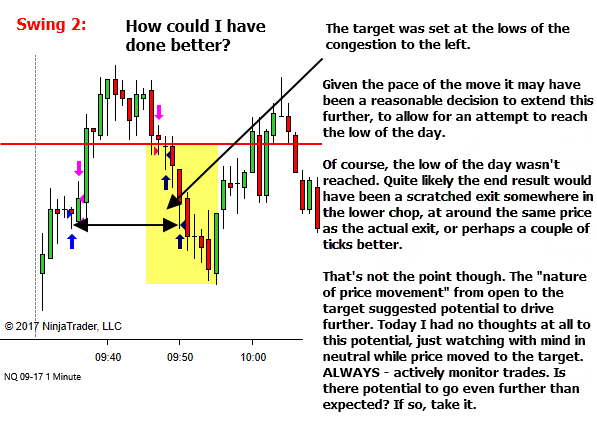 Those trading 3 or 5 min charts will likely find one hour segments better than 30 minute segments. 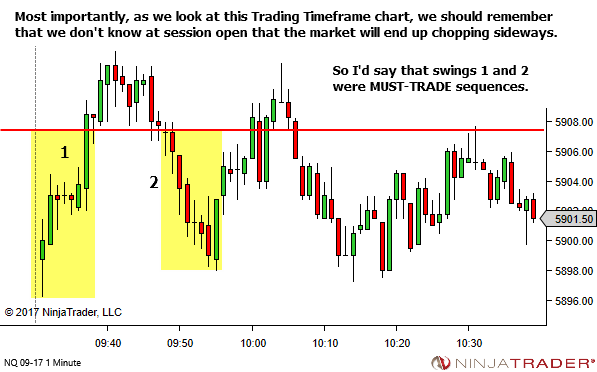 Higher trading timeframes may even find value with 2H or 4H groups. Again… I'm not sure why we don't see this used more often. Give it a try! I love it! I'm not going to reveal all I've found in using this approach. I want you to play with it. 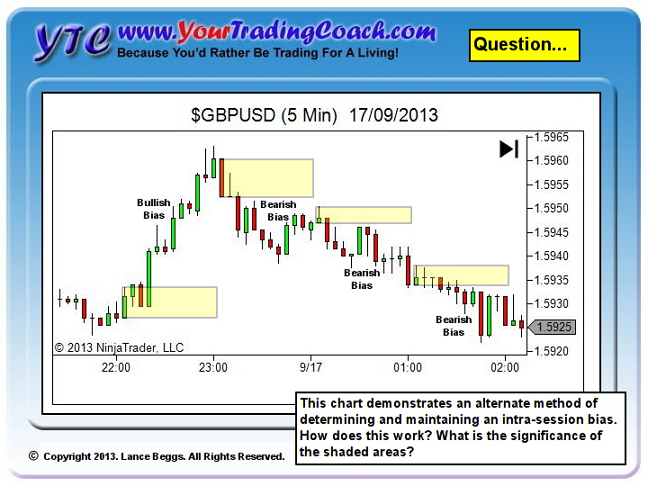 Explore the idea on some charts. Run it alongside your current methods. If it adds no value, drop it. 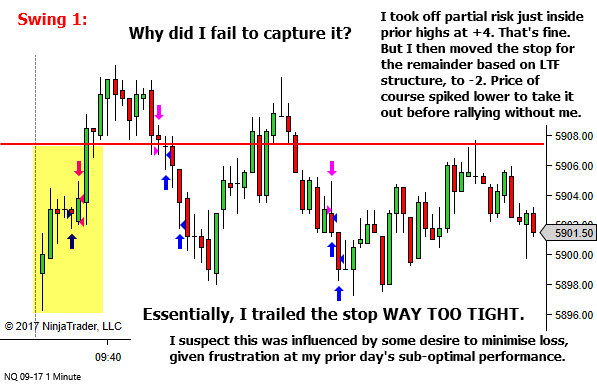 But maybe… and I suspect this will be the case for many… it will become a quite useful tool in your trading toolkit. Within the context of the "bigger picture" session bias and other analysis information available from standard opening range theory, we now have a method of assessing the same information on a shorter timescale. 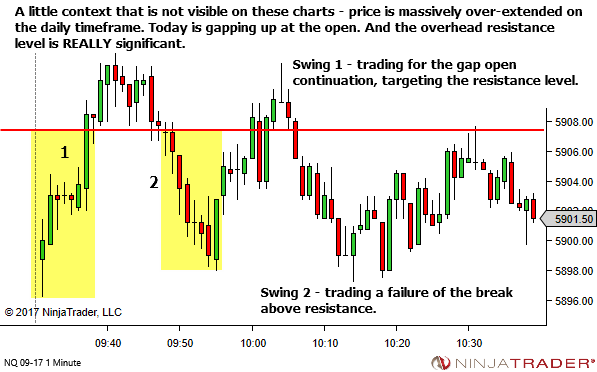 So as with the standard approach, price movement from the 1H or 30M Opening Range gives us insight into either bullish or bearish or neutral bias. 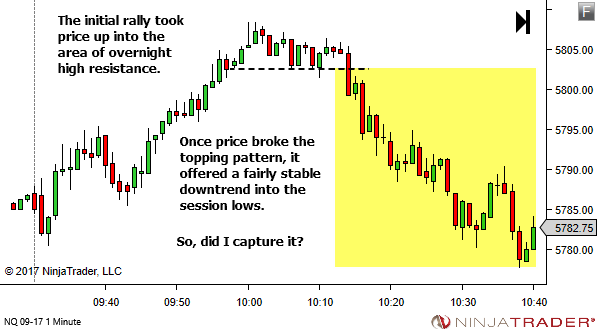 And the ease with which price moves away gives insight into the strength and weakness. 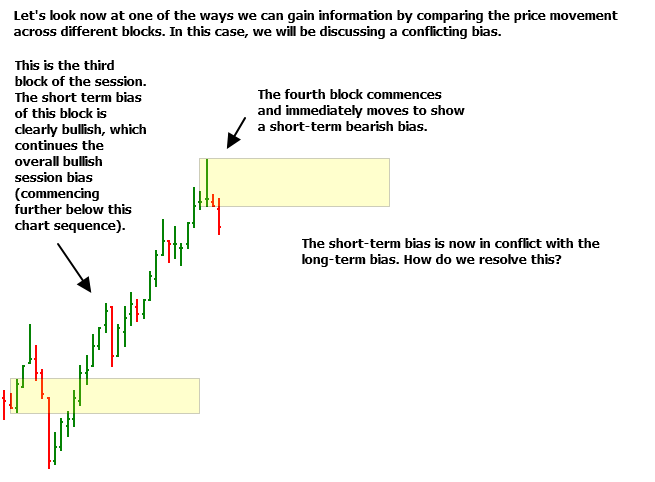 (a) Reference the shorter-term 1H or 30M bias information to the longer-term session bias information, as the shorter-term acts to move with or against the longer-term bias. (b) Reference the current 1H or 30M bias information to that obtained from the previous one or two 1H or 30M segments. That is, we get information into the way that price is moving. Is it stable, maintaining previous direction, pace and volatility? Or is something changing? I might leave this here for now. Again, rather than provide examples, I'd like you to play with this idea and see what you think. 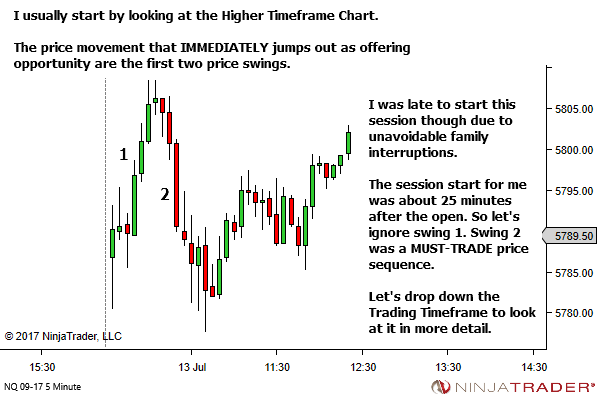 Plot an opening range box around the first "trading timeframe" candle each 30 minutes (or one hour). If there seems to be any interest then I'll follow up with a part-two in coming weeks, looking at the short-term 30M Opening Range on a few price charts.